On this rainy, with spots of sunshine, Saturday, 19 May 2007, I sit in the church occupied by my forefathers: St. James Church, Oddingley, Droitwich, Worcestershire, England. The sense of history is, if I may say so, palpable. 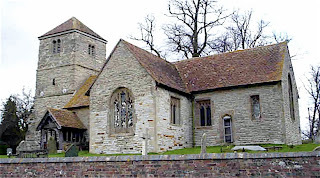 The church is not very large, though perhaps deemed quite respectable in the 15th century (ca. 1460), when a window above the altar, was dedicated to John and Joanna Yarnold. Yarnold, which derives from the Norman words for "eagle's rule," has been spelled also as Yarnell and Yarnall. The Yarnolds/Yarnells/Yarnalls of today may trace their ancestry from this small church in the west of England. It is a quiet place with a wonderful view, being set on the side of a hill looking over a valley through which a small canal flows. The horses run at their leisure in a field to the north, a large home is located to the southeast and fields of various types stretch into the distance. One can only imagine why the Yarnells left this paradise on the northwestern edge of the enchanting Cotswolds, if one were to realize that persecution will often drive people of conscience to change their location rather than their religion. The Yarnells of the 15th and 16th centuries were at least nominally faithful children of the medieval and then Reformation church of England. But in the 17th century, they were swayed mightily by the preaching of the Quakers. Some of the Yarnells then immigrated to the new colony established by the wealthy Quaker, William Penn. The largest cluster of Yarnell families in the United States thus may be found in Pennsylvania and the surrounding states. There are significant branches represented in Arizona, Arkansas, Louisiana, and now Texas, too. 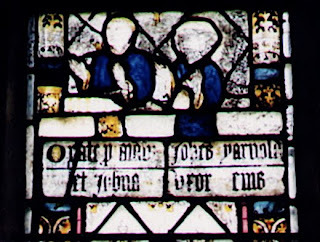 The Yarnold window asks in Latin for the observor to pray for the souls of John and Joanna. And so I shall, though perhaps not in the way intended by these pious medieval Christians. For, though I am no Quaker, I am a fellow free churchman among the baptizing churches. I have a history of Christian piety in my family, alongside a history of military servants, and I pray that this tradition will continue among my children and theirs. Although the destiny of our ancestors is determined already by their faith or lack thereof in Christ, we may pray for (and witness to) those who are alive now or are yet to be born. Medieval society was divided between those who pray, those who fight, and those who work. It seems that my ancestors have included all three estates, though not very high in any, except in the new world, which opened the door for meritorious achievement, including ministers, the calligrapher for a very famous writing by Thomas Jefferson, as well as admirals, physicians and managers. Thank you, Lord, for allowing me this poignant moment in the beautiful countryside from which my family descended. It is nice to know that there were people who were respected in society as being faithful in your eyes in the past, stretching at least into the 15th century, and perhaps far beyond. Interestingly, not only is the window dedicated to Matthew, but a recent grave to the left of the entrance door is occupied by an Elizabeth Joy Fabricius who lived to see grandchildren and was beloved. My own Matthew and Elizabeth Joy would find that of interest. Hello! I stumbled on this beautiful post today while researching my family tree. My mother is a Yarnell. How fascinating to find this beautiful little church. D E Yarnold, would you be willing to share that? WOW! I am married to a Yarnold from England. I keep telling him we have to go to this place! I too am a descendant, now living in Australia but originally from southern England. I've also been tracing my family tree for more than 35 years since a teenager :) This was a reflective and lovely piece, thank you.